Stagecoach bus fares for one-off short rides is expensive, but there various passes can offer cheaper travel. In particular, they have introduced a 'Stepping Hill 7 day' ticket which for £5 (June 2016 price) one can make unlimited trips on their buses for 7 days between the Park and Ride and any stop in Hazel Grove as far as Stepping Hill Hospital. Details on the Stagecoach website. A look at some places to leave your bike in Hazel Grove. 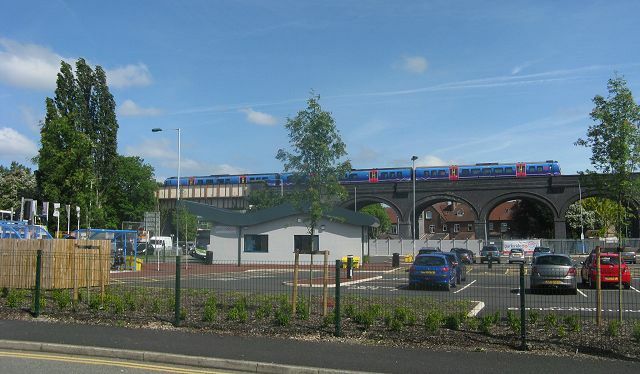 First, the Bus Park and Ride facility in Hazel Grove, which has been developed by the Stagecoach bus company on a large area of derelict land adjacent to the terminus of their 192 route to Manchester. 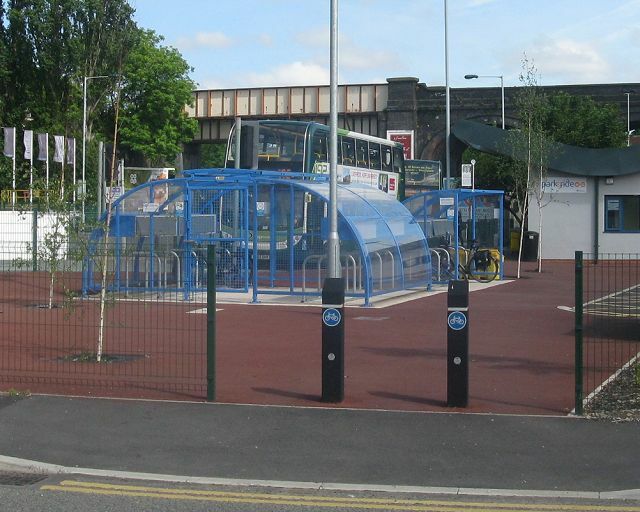 This is well laid out for cyclists, with cycle storage adjacent to the bus stop and with an handy cycle/pedestrian access from Melford Road as seen above. A signalled pedestrian crossing (not a 'Toucan') across Macclesfield Road facilitates access for anyone cycling from the Poynton direction. 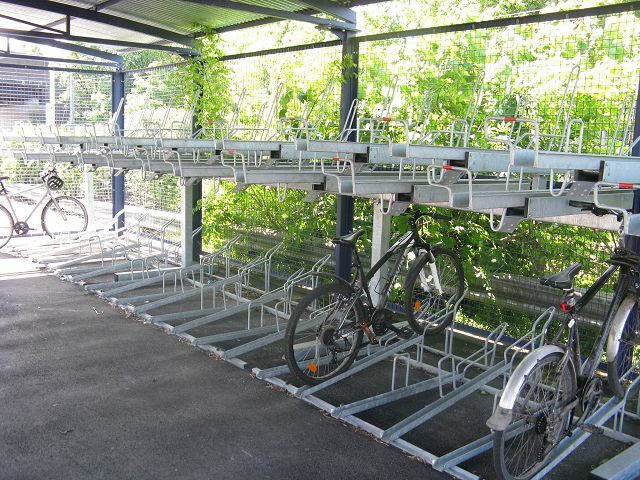 There are two cycle stores provided: closed one with two rows of stands and an open-sided one with one row. The door of the closed one has no security access a bolt which was unlocked at the time of our visit can be padlocked: the purpose of this is not immediately clear. 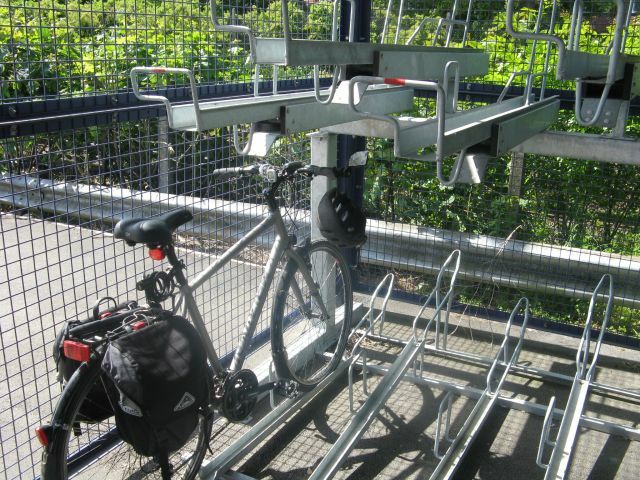 Above each individual bike stand (in both stores) is a small locker for a helmet, with a hasp for which the user can provide their own padlock. Of course we had to wait for a train to pass! This TransPennne Express Class 185 is on a Manchester - Cleethorpes service. The office building has some useful public toilets, finally replacing the council-owned facility at the road junction which was closed about 20 years ago. 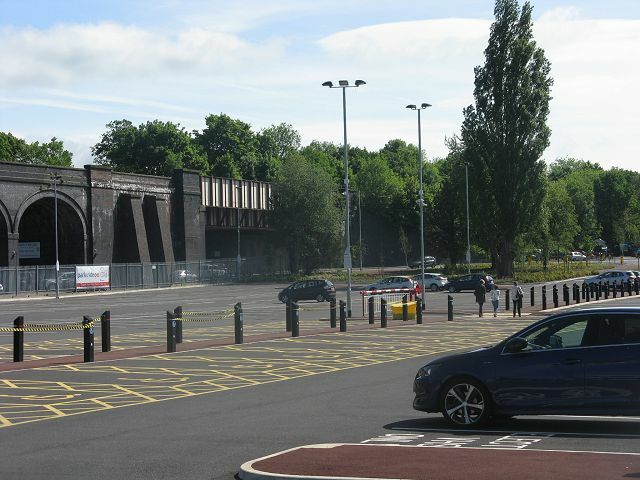 The 400-space car has another entrance on Buxton Road as well, but car drivers cannot use it as a 'rat-run', as the locked barrier seen in the centre of the picture prevents access. These pictures were taken at 11am on a weekday: take-up of the facility by commuters does not seem to have blossomed in its first few months. Of course the A6 is very congested at peak times, and the accommodation in the buses is quite cramped, but they do have free Wi-fi which might be an attraction for some. It is possible to cycle between the two roads, however, by following the path between the line of bollards, about to be used by the pedestrians in the picture. 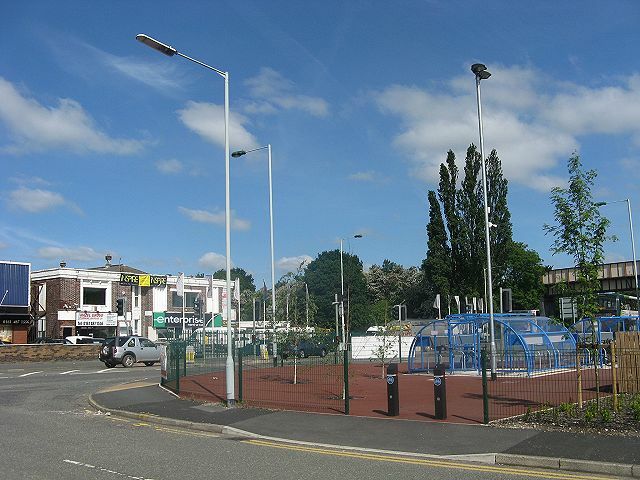 Looking back towards the bus terminus shows the large area occupied by the car park. The impressive bridge span built by the Midland Railway in 1901-2 dominates the scene at the Buxton Road end. Cars exit by a light-controlled junction, but cyclists heading north can by-pass this by a short length of shared path and a 'cyclists rejoin carriageway' sign. (Until this development, a derelict house rotted away at this location.) Why anyone would want to do this rather than using Macclesfield Road, however, is hard to see. 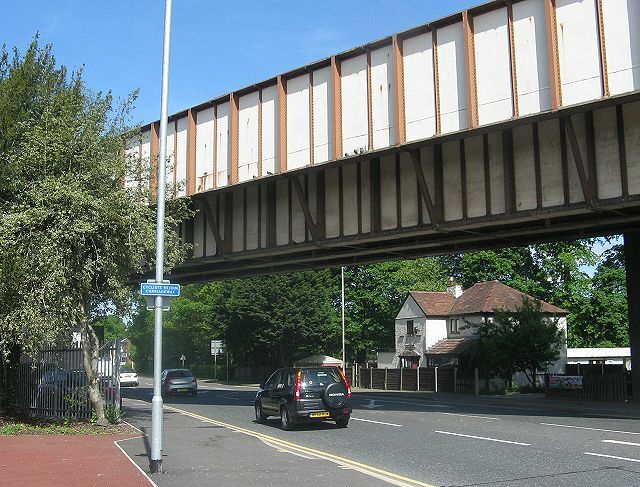 Cyclists on the A6 from the High Lane direction can best reach the cycle parking area by turning left further south into Turnock Road and travelling by Kyle Road and Melford Road. On via the A6, turning left at Macdonalds to reach the cycle path leading to Hazel Grove station, where a varied choice of parking is available. Ordinary stands, some of those little-used bike lockers, and a new Northern Rail bike store. Sadly, my TfGM bike member's smart-card had no effect on the door, which I realised was because the access system was out of order and I could simply push the door open. As usual with Northern Rail's Dutch-inspired facilities, double-height racks of a very awkward design are fitted, with their attendant risk of head-banging. Pulling the door open to get out again was a little more tricky, as there is no handle since it is designed to open and close electrically, but I managed to pull on a device at the top of the door. One does wonder whether the powered door mechanism is really necessary, or the door could be made to close by a spring as seen on the NCP bike store at Stockport station. Finally, a shopping stop at Sainsbury's supermarket, which has by far the best cycle parking facility in the area. 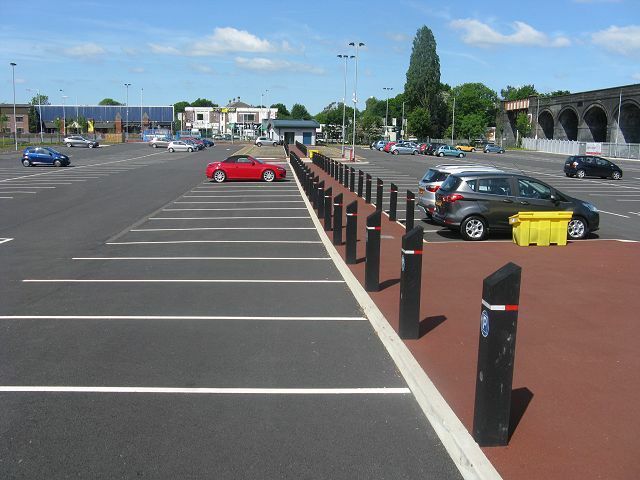 A sensible number of stands are placed where they are protected from the elements to some extent, and are visible through the windows to customers and staff at the checkouts. A cycle lane is provided on the access road. A contrast to other stores in the area where cycle parking is really quite poor. 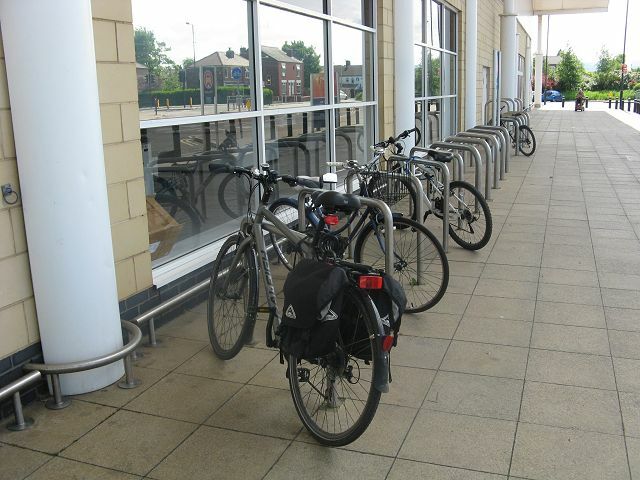 Asda, nearby, has a small cycle shelter which is used by the staff to park trolleys and/or have a crafty smoke. The Co-op, despite its claim to 'green' credentials, is notoriously lax in providing cycle parking, usually offering a couple of 'wheel-benders' or nothing at all.